“to provide legal advice for those of slender means and resources, so that no one would be financially unable to prosecute a just and reasonable claim or defend a legal right; and to allow counsel and solicitors to be remunerated for their services”. It is fair to say that this principle has been eroded over the years. Eligibility for Legal aid has been virtually wiped out for many citizens since 2013 under the Conservative and Liberal Democrat Coalition. But the principle remains. For example, it was recently reported that in 2017 the Government had spent £4.2m on legal representation at inquests. At the same time just £92k was paid to families of victims by way of legal aid. Most people would agree that this is iniquitous. The state provides legal aid so that all sides can have equal access to justice regardless of their wealth. What is the point of having legal rights if only the rich can access them? And so to 19 year old Shamina Begum. It has been national news today,that she has been granted legal aid to contest the removal of her citizenship. It is very predictable that the Daily Mail has reported this as if it is some sort of hand-out. The rest of the media seems to have followed suit. Foreign Secretary, Jeremy Hunt, is reported to be 'uncomfortable' with the decision to give her legal aid. That is the thing about justice. It isn't always comfortable. Comfort is not what it is about. This is not about her popularity. Access to Justice is not limited to those of whom we approve. It is possible to despise her and all that she stands for, and at the same time, acknowledge that there are important issues here that should be addressed by a court. This is an issue which should be a concern for us all. When, and under what circumstances, can out government remove person's citizenship? This is a matter for judges, not the media, to decide. 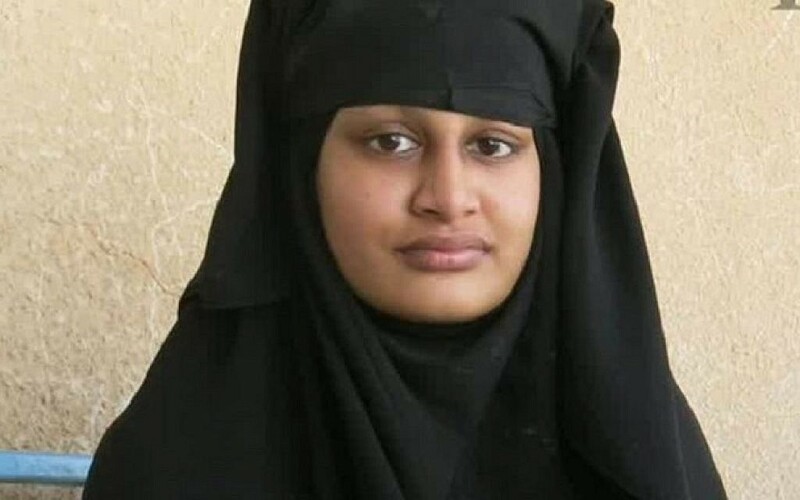 Her citizenship has been removed by the state. The state is required to show that it has acted lawfully. That can only be achieved if Ms Begum and the state are equally represented. This is why we have scales of justice. Does she require legal assistance? She does. Can she afford it? Probably not but that is a statutory test, and a strict one at that. Is the necessary work in scope? It is. There is no requirement that a person be popular or to be considered deserving of help by the tabloid press. Justice is not a bag of money, it is a right. Shocking Landlords, bad tenancies and the need for reform! He reminded me a bit of Bradley Hardaker the wealthy mill owner in the comedy, Brass who complained that his workers enjoyed the beautiful view of his mansion while he had to look done on their miserable hovels! And he has a point. Most private tenants have assured shorthold tenancies. These tenancies began back in the late 1980s. I remember speaking at an event in 1989 and warning of the damage that would be done to blameless tenants! I was an angry young lawyer then. I'm an angry old lawyer now. Nothing has changed! They are now covered by the Housing Act 1996. They are fixed term tenancies normally of 6 – 12 months. At the end of the term the tenant can agree a new tenancy, but the rent will almost certainly go up, or they can stay put. In the latter case the rent stays the same, but they have no real security at all. So long as the landlord serves proper notice – how many references were there in the BBC documentary to s21 (Housing Act 1988)?? So Mr Ferguson spoke the truth. After the end of the initial term the landlord can pretty well do what he/she likes. This has even seen the growing usage of the phrase ‘revenge eviction’ for those who complain of disrepair. One young couple in the documentary agreed in principle to a rent increase but asked about repairs. They were promptly served with an eviction notice. The forthcoming Homes (Fitness for Human Habitation) Act is great news for tenants but could be a double edged sword for some. Surely the time has now come for a root and branch reform of these outdated and unfair tenancies. They were bad enough back in the days when people could still afford to raise mortgage deposits, when tenants knew that their benefits would cover rent and when there was no housing crisis. In the current climate they must now be put to rest for good. I cannot remember when I last posted twice in one day. But the decision of the Legal Agency to refuse Legal Aid to the family of Molly Russell for representation at the inquest into her death is crying out for comment. This has led to a huge public debate about the influence of social media and the responsibility of these platforms for the safety of their young users. Instagram has pledged to ‘blur’ images of self-harm on its site which now boasts over a billion users worldwide. This is a major issue which affects us all – both at home and across the world. Molly’s inquest is an opportunity for many questions to be answered. Questions that concern families everywhere. The whole argument here is whether there are dangerous practices which present significant risks to the lives of young people in the context of a particular child. This debate had made national news. The refusal of legal aid has made national news. If ever a case was ‘exceptional’, this is it. The public is entitled to a full inquiry into the role of social media in Molly’s death, so that the lives of others can be protected. There is little doubt that the social media industry will have access to the best, and most expensive, legal representation. This refusal of legal aid beggars belief. It makes you wonder if any case can satisfy the guidelines. Following the predictable outcry the Legal Aid Agency has now reversed this decision!! The new SRA Code - a lingering concern! This brings me to an issue that, for me, has a major concern since the changes were first proposed. Under the present regulations a Solicitor can only provide legal services to the public via an organisation regulated by the SRA or other approved regulator. Some legal work is ‘reserved’ and some is ‘unreserved’. Reserved work can only be carried out by an authorised person such as a Solicitor. This is a surprisingly limited category of work and includes the power to conduct litigation, to appear before certain courts and the drawing up of certain documents. Almost all other legal work is unreserved which means it can be provided by anybody. You don’t have to be a Solicitor to set up a business offering advice in say, employment law or welfare benefits. But if you are a solicitor you must still operate through a regulated body – such as a solicitors’ firm. The reason for this is that there are standards and protections that go with the solicitor brand. For example, all solicitors’ firms must carry professional indemnity insurance. They also must contribute to a compensation fund. If a client instructs a solicitor, they know that if anything goes wrong there are levels in protection in place. If solicitor is negligent then the insurers must meet any claim. If the solicitor is guilty of misconduct, including failing to take out insurance, then the compensation fund is a safety net. This has been a foundation stone of our legal services. The new code promises to change all of this. There will be two separate sets of professional rules. One will cover individual solicitors and one will cover regulated firms. The proposal is that solicitors will be allowed to provide ‘unreserved’ services through unregulated organisations. So someone can set up an HR Consultancy and will be able to employ solicitors to offer legal advice to the public even though that consultancy is not regulated. The thinking behind the plans is that solicitors are a commercial disadvantage. The cost of regulation means that some organisations can provide the same advice at much lower cost. Insurance is one of the biggest overheads in most forms. Why is this a concern? Firstly it threatens to devalue the solicitor brand. If someone can see a solicitor in an unregulated firm with no insurance or other regulatory protection then the security of knowing that there are guaranteed protections will disappear. This is not something that can be defined purely by cost. I can also see dangers, particularly for young lawyers. The SRA say that all solicitors will be subject to the rules that will apply to all solicitors regardless of where they work. But this will put huge pressure on those individuals. If an inexperienced solicitor is working for an unregulated organisation, they can find themselves conflicted between the demands of the business and their personal professional rules. Such solicitor might well have a strong claim for unfair dismissal but someone with a mortgage and a young family can still find themselves in a very vulnerable position. We should all encourage moves to bring legal services into the 21st century. The more bodies providing access to legal advice the better. I am also all in favour of easing the burden of regulation. That would give compliance officers fewer sleepless nights! But there are also minimum standards of service and protections that must hand in hand with instructing a solicitor. Without this we will have a two-tier profession offering services to a confused public. I do foresee major issues arising when the rules come into force later this year. A nostalgic exchange on Twitter this morning has reminded me that this year will see the 60th anniversary of, probably the most remarkable incident to have occurred in Liverpool County Court, one which made a legend of a local District Judge (or Registrar to those of us of certain age). In August 1959 Graeme Bryson, known to us all as Paddy, was sitting in the bankruptcy court in Liverpool. The party in court drew a gun and shot at him. One bullet grazed his ear before it damaged a portrait of Judge Fraser Harrison, another wounded an unfortunate court official. The gun then jammed enabling the courageous judge to wrestle the assailant to the ground. 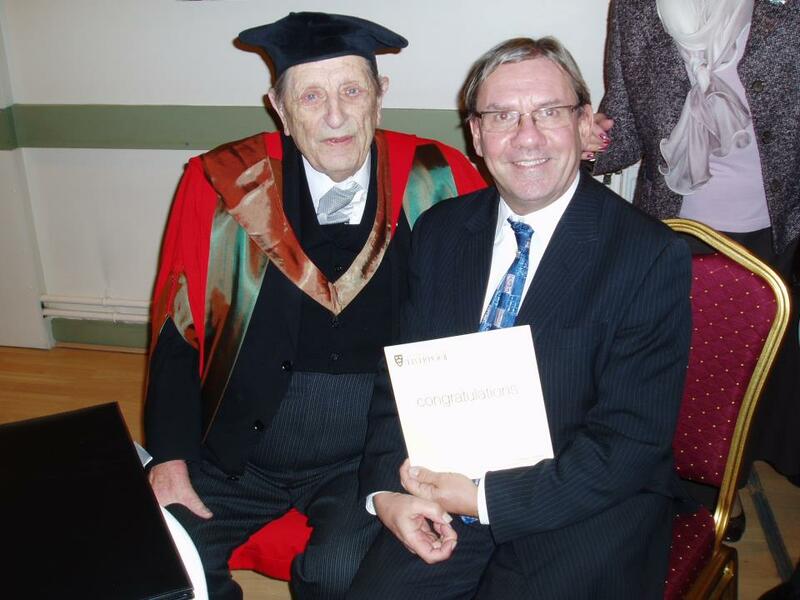 Bryson went on to be a highly respected Registrar and was President of Liverpool Law Society in 1971. 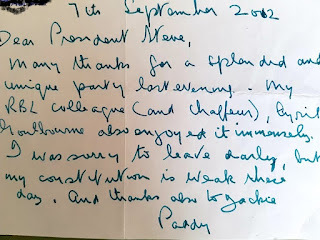 I was helping to plan a dinner for his 100th when he sadly passed away on 28th September 2012 just a 5 months short of the big day. Just 3 weeks earlier he had attended a social event that I had put on at Everton FC (where else?). 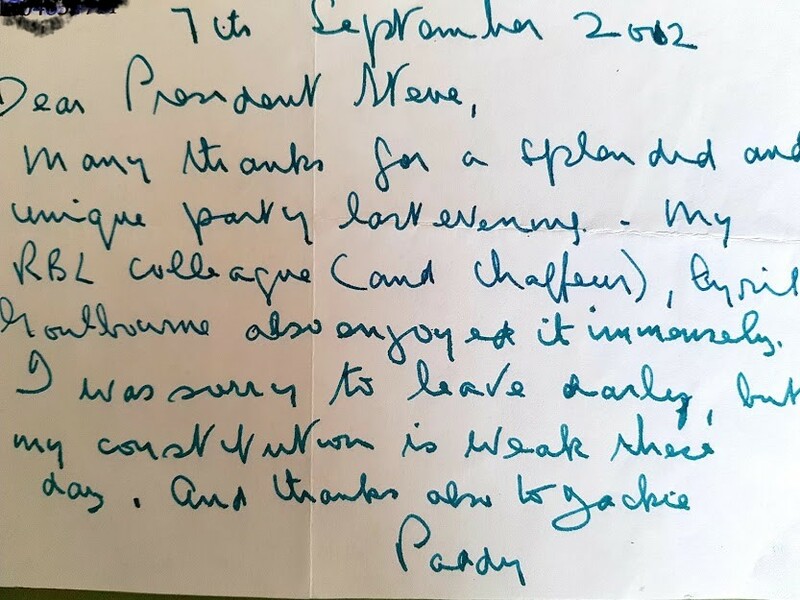 He sent me this lovely note afterwards, apologising for leaving early because of a weak constitution at 99yrs 7 months. If I have any sort of constitution at that age there is no justice!! 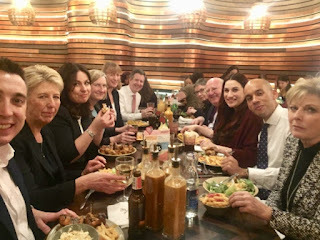 One recurring theme from the new Independent Group of MPs is that our politics is broken. Their Twitter hashtag is #ChangePolitics. One of the most popular hashtags used by lawyers over the last year has been #thelawisbroken, largely due to the brilliant @secretbarrister. I have often talked about the access to justice waste land. This new grouping could of course fizzle out. But it includes some very strong politicians. One recent poll had them at 18% even though they are not yet a party. If we are going to cherish the rule of law we must ensure that this goes hand in hand ‘unimpeded access’. I would encourage the new group to take this message on board and commit to doing something that really will change politics and make a real difference to the lives of many. European Court of Human Rights and Brexit again! Brexit currently seems to fill every breathing moment. There remains a lot of confusion and misunderstanding. But there is one matter that has raised its head again. This is the mistaken belief, alarmingly repeated by the Leader of the Opposition last week, that Brexit has something to do with the European Court of Human Rights and the Human Rights Act 1998. I do not normally reproduce blogs from the back catalogue. But I do think that we need a further brief history lesson. I first posted this in 2016 shortly after the referendum. 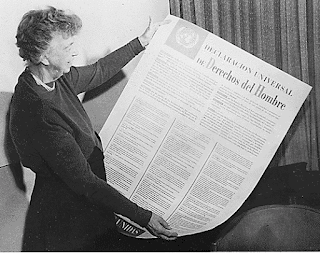 Eleanor Roosevelt described the Declaration as her greatest achievement. There was also a determination that co-operation in Europe was an essential pathway to peace. In 1946 Churchill spoke at the University of Zurich and spoke of the need to create a United States of Europe! (Imagine the noise in certain quarters if he said that today!). In fact the body that came into existence was the Council of Europe which was launched in 1949. One of its first achievements was the European Convention on Human Rights in 1950. The Convention followed the basic rights contained in the Declaration. The UK was probably the main driving force behind the Council and the Convention. The European Court of Human Rights (ECHR) was created in 1959 to adjudicate on matters arising from the Convention. Until 2000 any UK citizen who complained that their rights had been breached had to go to the ECHR in Strasbourg. In 1998 the UK Government passed the Human Rights Act; a short Act which incorporated the Convention into UK Law. This came into force in 2000 and meant that UK courts had jurisdiction to hear cases. The ECHR has retained its place as the final court in Human Rights cases, but only after all local remedies have been exhausted. There is nothing in the Human Rights Act, or the Convention that says prisoners can have a Big Mac in their cell or that suspected terrorists cannot be deported! But the most important point is this – the ECHR has nothing at all to do with the EU, the referendum or Boris Johnson. Any Bill of Rights would certainly have to protect the rights set out in the Convention so is unlikely to change much. My fear is that some might have voted to leave the EU in the belief that it would somehow remove these rights which have had a bad press, often due to misunderstandings and hostile reporting. In fact the Leave vote has no effect at all on our Human Rights one way or the other. All EU member states have signed up to the Convention, so exit could pave the way for an extreme government to try and force us out of the Convention at some point in the future. But it is unthinkable that the UK would try to abolish the very rights that were created by our leaders. In removing these basic rights we would be aligning ourselves with some very questionable regimes!